Discover live interactive gaming broadcasts from all over the world. Watch Esport tournaments, let’s plays, speed runs, walkthroughs, game reviews and thousands of other gaming events broadcasting across multiple video streaming services. You can interact with the broadcaster and audience by sending real-time messages via chat and share your viewing experience with friends and followers. • WATCH broadcasts from all content creators via multiple video streaming services. • EXPLORE topics and millions of channels to find live broadcasts that interest you. • RECEIVE tailor-made suggestions and see what your friends are viewing in your personalized content flow. • DISCOVER top quality broadcasters that stream anything from action, adventure, arcade, MOBA, racing, shooter, MMO, horror, simulator, RPG, strategy and more. 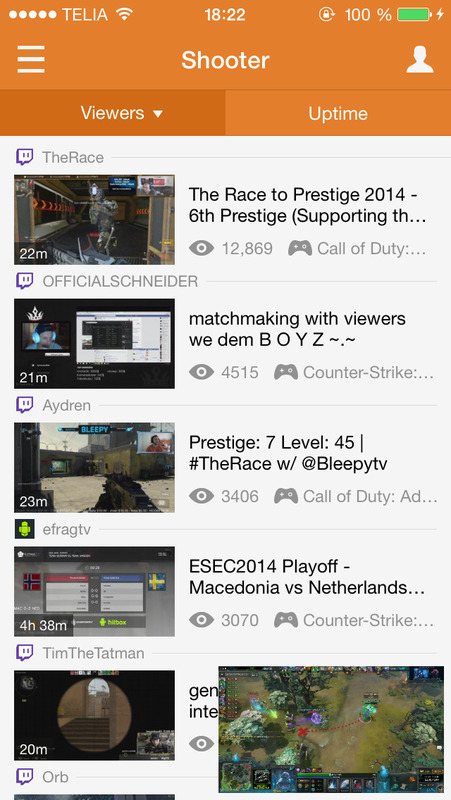 • STAY UP TO DATE by following your favorites and get notified every time they start streaming.